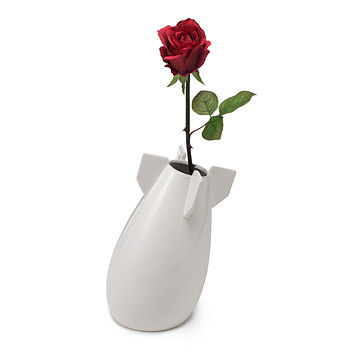 Cultivate peace at home with this white ceramic bomb vase. When full of flowers or plants, the peaceful bomb is a powerful symbol of freedom and life. A peace sign graces the base to drive the message into the ground. Made in China. Designed in Taiwan by Owen & Cloud. In 2000, Taiwanese designers Owen and Cloud furthered their passion for design and pursued their studies in Tokyo, Japan for five years at the prestigious Musashino Art University and Tama Art University respectively. During their tenure in school, both extremely devoted to their creative works, they were awarded many international design awards from Japan, Hong Kong and Tawain. In 2005, after finishing their studies they founded "biaugust CREATION OFFICE" in Taipei, Taiwan. They are focused on fusing life and emotion and exploring new possibilities between humans and design with a a variety of mediums. I'm going to get some bamboo for it. The Peaceful Bomb Vase is perfect for anyone who appreciates unique home accessories. Certain to be a conversation starter in any household.